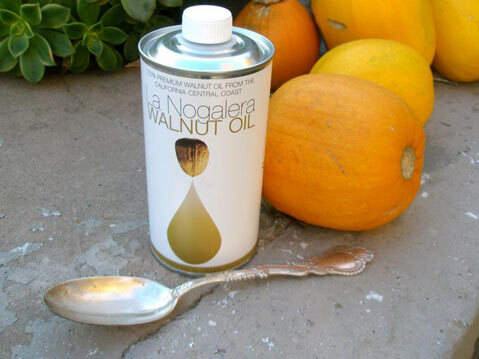 La Nogalera Walnut Oil is the product of the shared efforts of three Santa Barbara County growers: Mary Jane Edalatpour, Art Hibbits, and Jose Baer, whose historic groves in Lompoc, the Santa Rita Hills, and Santa Rosa Road in Buellton are among the last remaining walnut orchards along California’s Central Coast. Their premium oil is made using a carefully developed blend of heritage walnut varieties chosen for richness of flavor rather than appearance, and the nuts are dried and roasted before pressing. The result? A delicate, toasty-tasting oil with a subtly sweet aroma, and all those omega-3 benefits to boot. It’s perfect for dipping bread, drizzling over vegetables and pasta, or brushed over fruit with honey. For more information, recipes, and where to buy (including Farmers Markets), visit lanogalerawalnutoil.com.